When Mark Stevens was in high school, he faced a dilemma. He was preparing for the state high school wrestling championships, and the Lisbon student/athlete weighed 140 pounds on Monday, just five days before his shot at glory. Greyhounds coach Bob Donelan didn’t agree that Stevens was working to lose the weight, as the senior wanted to make the 126-pound division. Lots of running and a lack of food, combined with a never-ending determination worked for Stevens, as he lost the pounds and then defeated Mt. Blue rival Ralph McArthur, 6-4, in the 126-pound title match to capture the state championship. The year was 1982. Fast-forward 32 years, and Stevens, who led Lisbon to seven state titles as the Greyhounds’ coach, is leaving the sport that he has loved, left, came back to and endured in. When Mark finished his high school wrestling career, he was quite happy to leave the sport behind. He was burned out and was off to serve in the U.S. Air Force. But, soon wrestling was again a big part of his life. When Mark’s time in the Air Force ended, he returned home, but still wrestled in open tournaments at Hyde School in Bath. Mark was on the mat the day before his first child was born. Coaching, something Mark never considered, came about in 1992 when the Lisbon athletic director asked him to begin a middle school program at Sugg Middle School. He was assisted by Bob Earle, and soon the duo turned the Greyhounds into a force to be reckoned with. Coaching was difficult for Mark at first. So he turned to his wife, Gretchen, for some advice. Mark’s chance to move to the high school came in 1996, and the rest, as the saying goes, is history. In 1998, Mark remembers taking his young Greyhounds to Rumford to face Mountain Valley, coached by Jerry Perkins. Mark soon had Lisbon pointed in the right direction, culminating in winning the State Class C championship in 2001. Mark remembers a speech he gave to his team the night before the state championship, a speech he has repeated every year since. Mark remembers talking to the Dexter coach during that same meet. Dexter had won the state title three years in a row, and was a favorite to make it four. State titles continued to come, with Lisbon taking the top prize in Class C in both 2002 and 2003. Mark began coaching field hockey in the fall, as daughters Amanda and MaKayla made their way through high school. 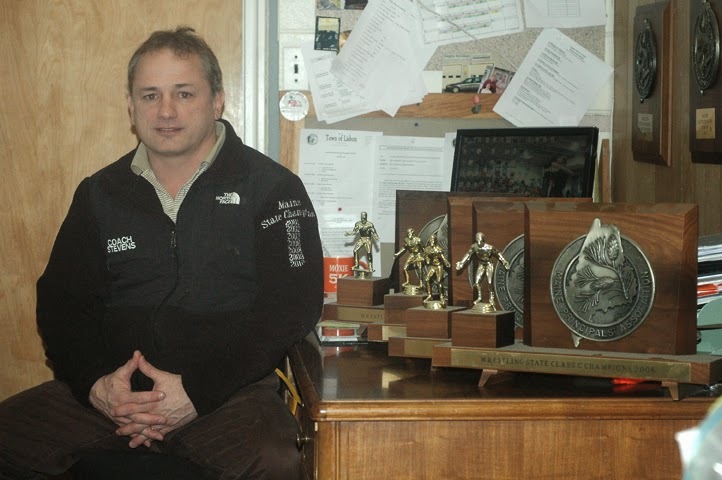 But, in the winter it was back to the mat, and Mark had his team on a roll again, with state titles for the Greyhounds coming in 2006, followed by three consecutive titles from 2008-10. There were great champions in the 2000s, names like Forest Cornell, Giusto, Mike McNamara, Marcus Bubar, Cameron Bubar, Mike McManus, Nate Hix and Will Vice, but Mark also remembers those who came up just a bit short in reaching their goal. Mark felt that a turnaround at Lisbon came with the hiring of athletic director Jeff Ramich in 2002. There was a moment when Mark nearly walked away from the sport. He recalled a family drive that changed his mind. A lasting image for Mark appears on his laptop computer. In Zach’s final match for Lisbon, the senior won his third state title. He rose from his feet and gave his dad a big hug, with tears filling their eyes. “When he was a sophomore, after he won he jumped into my arms, and that was 120 pounds. I said, ‘now you’re a lot bigger, and what will happen if you jump up into my arms again?’ We decided we were going to high-five, and I went to high-five him, but he said no and we hugged. It was more of a relief for him. His goal was a state title, and he wanted it. He did it well and I am proud of him. Mark quickly changed gears and reflected on his final team’s successes this year. Mark has a long list of fellow coaches, volunteers, assistant coaches and parents to thank. “I have been fortunate to have learned from some of the best coaches in the history of Maine wrestling. My high school coach Bob Donelen, and several great coaches including Dennis Bishop, Jerry Perkins and the late Gary Kent. I have learned every step of the way, from my wrestlers, to my assistant coaches and coaches from other teams. “Anyone who knows anything about building a team like Lisbon wrestling will tell you that it takes a community, not just one person. Bob Earle and Ted Albasini both have been coaching with me for over 10 years. Bob retired in 2007 shortly after being selected as National Assistant Coach of the Year for USA Wrestling Magazine. I have a lifetime of gratitude to give to Bob and Ted. Bob was a life cheerleader, always making me feel like I am doing the right thing. When I would make a decision that was not the right one, he would gently say, ‘coach you sure you want to do that?’ Bob was a hero to me and I would not have had the opportunities over the years if it was not for him leading me to be a better coach. “You have to love your kids and be willing to have them learn about the value of themselves. At the end of the day, I worked with a team of guys that helped kids to realize their potential, maybe prepared them for the challenges in their lives. I am so close to many of my alumni, and that is the value that I have given and received. We took a team of people and didn’t expect it. I never took it for granted because it won’t last forever. As is Mark’s way, he passed the credit to those who supported him. “I had some great help. It is not a one-man show. Even the dynasty that we had, it took a family of coaches, wrestlers, their parents and grandparents, and the community. “We taught our wrestlers good handshakes, character, with the cornerstones of wrestling being respect. The winning became a by-product of what we were doing in practice and it seemed to be a good recipe. “He has a way of bonding with his men and women,” said Earle. Posted in its entirety with permission. Mark Stevens is an amazing person. His license plate reads "amazack" for his son. How many young boys hug their dad's, IN PUBLIC! ! ! ??? That alone tells you what kind of person Mark is. says no child gets left out (because of the inability of the family to pay). We in Lisbon, and especially our children, are fortunate to have him here.